Classic tale of dragon meets wasabi meets vegetarian pizza place. Interestingly enough, the name has nothing to do with its worldly location. Brothers Adam and Aaron opened shop in the I.D. two years ago, but they are anything but new to the Seattle pizza scene. Their original digs were in Belltown, pre-dress code era, and the name was decided upon long before they were even thinking about an alternate (completely vegetarian!) location. Offering interesting toppings like wasabi-marinated pineapple, World Pizza has proven that glow in the dark pizza isn’t just possible, but people love it! The neon topping piques interest and pleases palates, plus it creates a nice tie to the neighborhood. Since they don’t have any specifically vegan pies on the menu, I asked the chef to surprise me with a few of her favorites. You can ask them to do the same for you, or create your own. If I may paraphrase, ‘we don’t sell anything we don’t like, and we don’t like fake cheese’. I can handle that. To be honest, I was a little curious how they would set themselves apart now that Daiya has infiltrated every pizza shop from here to… I think Ballard is about as far as I’ve gone. Their sweet sauce and crunchy herbed crust doesn’t need fake cheese – it’s a perfectly paired duo many years in the making, and fake cheese photographs terribly anyway so I am IN. 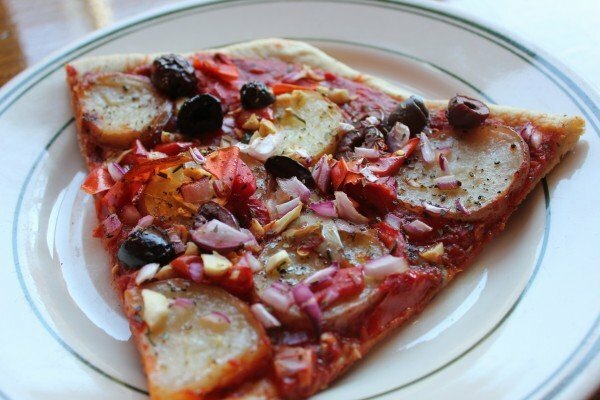 The kalamata olives and potatoes simply belong together, salty and savory and hearty and yummy. 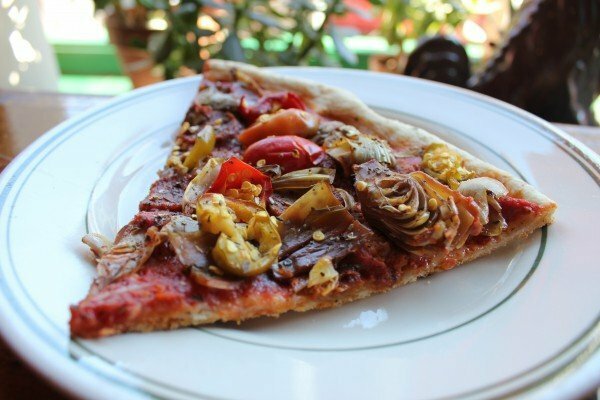 This slice stole a pizza my heart, now let’s forget I ever said that and move on. If you haven’t tried Field Roast Mexican Chipotle sausage, you should apologize to yourself. It is delicious and you are depriving your taste buds of a very basic human need: food happiness. So get up, ride your environmentally-sound form of transportation over to World Pizza, and eat some meatless pepperonis! They pack some heat, so if you’re a spice baby like I am, I suggest some milder toppings to go with. I’m thinking peps and potatoes for my next visit. The new-world combo, pepperoni and pineapple. I know pineapple on pizza can be a polarizing topic, so thankfully this conversation is one way, because I thought the pizza was fantastic and I don’t care what your Italian grandmother has to say about it (don’t tell her I said that). Sweet stuff surely isn’t meant for every kind of pizza, but this kind does it justice. It’s what I would call thick-thin crust. Light and crispy, but thick enough to handle a hefty dose of sauce and toppings without even entering the realm of sogginess. World Pizza is the cozy pizza hangout I didn’t think existed anymore. Guests leisurely enjoy their meals, employees hang out after their shifts end and the entryway has a big, beautiful orange couch I want to live on forever. One of my favorite parts of World Pizza culture is their pizza box art. Staff has free reign to draw all over the take-out boxes, and during the annual Dragon Fest, you guessed it, they draw dragons! Friends and regulars join in, and the masterpieces are hung above a giant “DRAGON” sign in the dining area. Last year everyone loved one 8-year-old’s drawing so much they made it into a t-shirt, for sale for $20. I’ll be wearing mine to Dragon Fest 2013 next weekend. Worldly advice: During their busy hours, they will happily make a vegan pie and sell it by the slice. Just call ahead. American advice: Use this cute red white and blueberry Field Roast recipe on the 4th to impress your friends with your patriotism. And cuteness. I know this has nothing to do with pizza, but the 4th is in three days. Just love your country and stop asking questions. Posted in Featured and tagged Dragon Fest, Field Roast, Josie James Keeney, Meatless Mondays, vegan, World Pizza. Bookmark the permalink. 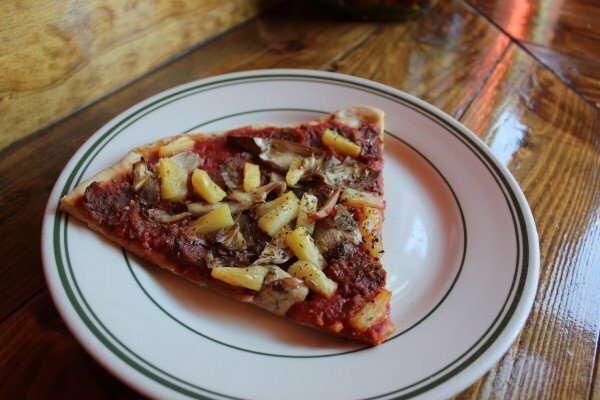 So glad you came in and enjoyed some of our vegan pies! Hope to see you during Dragon Fest, July 13th and 14th. Cheers! I had a few slices during Dragon Fest – my first visit to World Pizza……it was really tasty — loved the sauce! I will definitely be back! I smuggled in some anchovy paste and spiked Adams piece, causing him to unknowingly consume animals on meatless monday. I repent.